Welcome to the Alloy Kats Studio workshop. 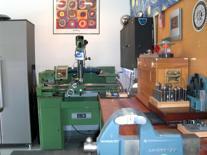 This is where an array of art products are created, prototyped, and fabricated. View the Gallery pages where you can see items that we have designed and sold. 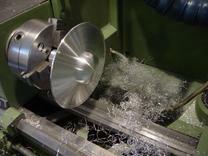 On the Products page you'll find our current products. Rick McConnell is co-founder/artist of AKS. His passions are art and science. 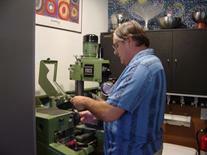 Rick has spent his professional career in state-of-the-art technology businesses. In his limited spare time he finds it refreshing to create art utilizing materials and processes that he has used in producing high technology products. Rick likes to convert ideas into physical objects. 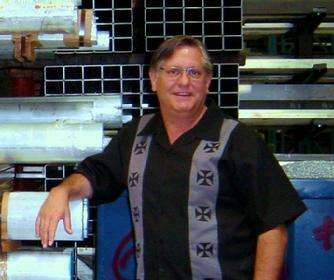 He enjoys machining or molding metals, plastics, and other materials including integrating electronics on occasion to create exciting and unusual works of art. Rhonda McConnell is co-founder/artist of AKS. Her background is interior design and art. 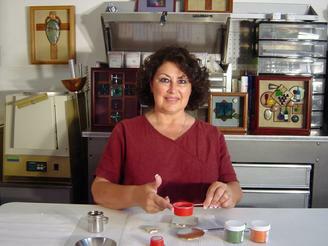 However, she is self taught in the art of fired glass enameling. Rhonda's passion is creating wall crosses from exotic and rustic woods and enamel. "I really enjoy using transparent enamels. It's fun to watch the way the enamel changes and plays on the copper after being fired." She also enjoys making necklaces from natural gemstones and complementing them with enamel pendants and pieces. All jewelry is handmade and original.